It has been quite some time since we've looked at any of those swivel-hipped vintage wonders of the early 1980s – Mattel's Masters of the Universe. MOTU action figures swept toy aisles by storm thanks to a fiendishly well organised merchandising campaign which saw the tie-in animated TV series He-Man and the Masters of the Universe turn these 5 ½ -inch action figures into the most-wanted toy of an entire generation...until sales eventually slowed down after the arrival of Transformers and G.I. Joe on the scene in the second half of the decade. Skeletor - It's not easy being mean! This chap may be a lovely shade of Smurf-blue, but that's as close as this turquoise terror gets to cute – Skeletor, arch-enemy of He-Man, is hell bent on capturing He-Man's mysterious power base Castle Grayskull, conquering Eternia...and the entire universe...MWAHAHAHA! 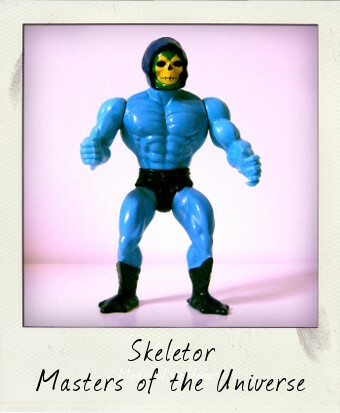 The very first Skeletor action figure by Mattel appeared as part of the first wave of figures in 1982. 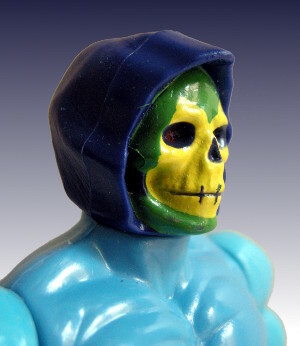 Collectors, however, will be aware of the existence of numerous variations associated with Skeletor: differences in skin colour, types of head hardness, as well as rare paint applications, such as the famous “half painted boot” variant. My figure is marked 1981 on both his lower back and on the back of his head. He is a bright blue, with a dark purple full paint job on the boots, black underpants (rather than purple), and a hard head (rather than the soft and squeezable variety), with the face painted in bright, almost clown-like colours. Being a loose figure, however, he is tricky to identify with 100% accuracy. He may well be a first wave issue Skeletor, but looking at the brightness of the blue he may also be a third wave 1984 reissue, described as "Skeletor - The Original" on the card, but still carrying the 1981 copyright date. My market stall find is missing his accessories of course – he was issued with a Havok Staff and Power Sword, and should be wearing a harness and belt – but his MOTU action gimmick of a twist-able waist, which powers a swing punching action, is still working fine. Even minus his weapons, he is nevertheless a fabulous vintage action figure, and a must have for any Masters of the Universe collection! Fellow blogger Jason Vorhees sent me a Skeletor fig a while back and i just love it.Just need to find his accessories to complete it.Great find!